NETWORK FINALS: The new CELEBRITY FAMILY FEUD and THE $100,000 PYRAMID both gained 0.1 in final numbers. CABLE HIGHLIGHTS: The big winner of Sunday cable was unquestionably Starz, which smashed past HBO and Showtime with a series-high 1.10 rating for the Season 3 premiere of POWER, transferred from Saturdays and up an amazing 0.49 from last year’s premiere. (The network will try to build on that by adding SURVIVOR’S REMORSE to the 10PM slot next week.) Meanwhile, on HBO THE NIGHT OF had no cause for complaint, doubling last week’s series premiere (which had previously been available digitally and on VOD) to 0.52. The season premiere of BALLERS dropped 0.31 from last year’s premiere to 0.79, but that was coming off a 1.42 lead-in from the season premiere of TRUE DETECTIVE; the number was actually up 0.08 from the 2015 season finale. BALLERS was followed by the series premiere of VICE PRINCIPALS at a compatible 0.55. On Showtime, RAY DONOVAN fell 0.08 to 0.27, and ROADIES lost 0.02 to 0.08. On basic cable, AMC’s PREACHER rose 0.08 to 0.63, and RIDE WITH NORMAN REEDUS ticked up to 0.21. On Adult Swim, SQUIDBILLIES climbed 0.08 to 0.61, and BRAD NEELY’S HARG NALLIN was up 0.06 to 0.50. On TNT, THE LAST SHIP lost a tenth to 0.52, and MURDER IN THE FIRST fell 0.09 to 0.20. USA’s MOTIVE was steady at 0.20. CMT’s STILL THE KING dropped 0.03 to 0.11. TV Land’s THE JIM GAFFIGAN SHOW lost a hundredth to 0.11. The KIDS CHOICE SPORTS AWARDS rating is a bit confusing. Apparently Nickelodeon becomes Nick At Nite at 9PM, so the rating is divided between 0.42 for the first hour, then 0.48 for the remaining 32 minutes. The show was also simulcast on a few other Viacom networks: 0.05/231K on Nicktoons, and 0.06/270K on TeenNick. The rest of unscripted was led by Discovery’s NAKED & AFRAID, down 0.02 to 0.71. 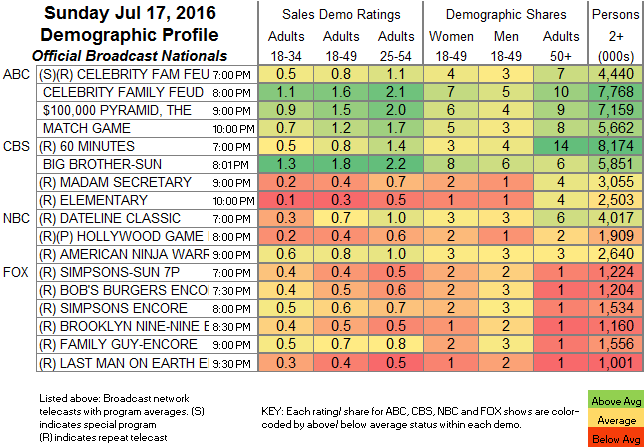 On E!, KEEPING UP WITH THE KARDASHIANS slid 0.03 to 0.68, and FAMOUSLY SINGLE fell 0.06 to 0.28. Bravo’s REAL HOSUEWIVES OF NEW JERSEY ticked down to 0.67, and SHAHS OF SUNSET was down 0.02 to 0.55. NBC Sports Net had a 0.66 NASCAR race. On Food Network, FOOD NETWORK STAR was steady at 0.57, COOKS VS CONS dropped 0.09 to 0.40, and GUY’S GROCERY GAMES ticked up to 0.36. VH1’s BASKETBALL WIVES was at 0.52, and SHAUNIE’S HOME COURT was at 0.31. Spike’s BAR RESCUE held at 0.41. A&E’s ESCAPING POLYGAMY rose 0.03 to 0.37, and INTERVENTION gained 0.07 to 0.33. 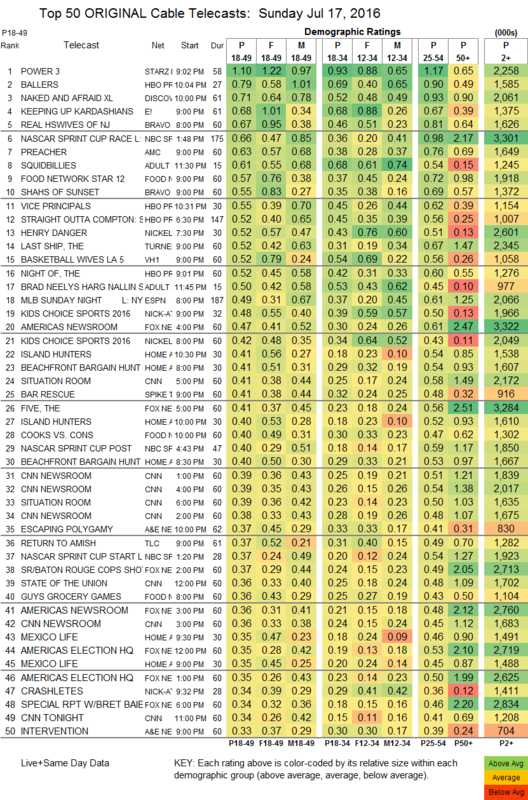 TLC’s RETURN TO AMISH dropped 0.07 to 0.37, and MY BIG FAT AMERICAN GYPSY WEDDING was at 0.24.